From places of worship to educational institutions and the former residences of prominent figures, 72 buildings have been gazetted as national monuments. Each is a yarn woven into the rich tapestry of Singapore's history. This is the 21st in a weekly series revisiting these heritage gems. Thousands of diners flock to the food paradise of Lau Pa Sat every day but few think about how they are sitting under a structure that is more than 100 years old. 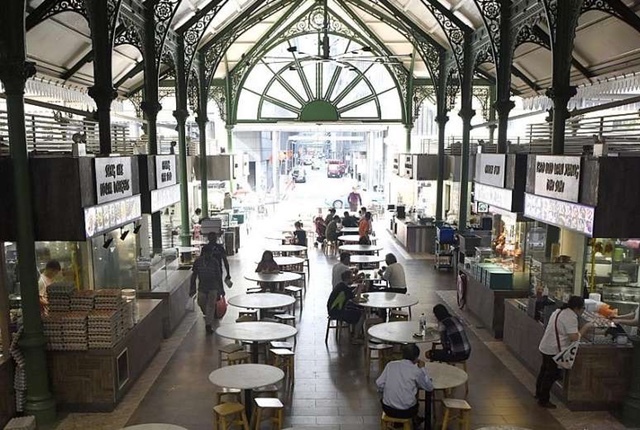 In 2014, the "old market" - as its name means in Hokkien - underwent a major $4 million revamp which provided more seating and better ventilation. But Kopitiam, which manages the food centre, told The Straits Times that care was taken to ensure the centre's historical elements were kept in place. Among them was the clock tower, with a clock face on every side, and its bells chime every 15 minutes. The building's unusual octagonal structure and cast-iron filigree were also preserved. The food centre today boasts seating for 2,500 people with 54 stalls that serve local and international delicacies. Though food prices went up after the revamp, so did the number of customers. About 15,000 to 20,000 people - both tourists and locals - visit the food centre on any given day, said a Kopitiam spokesman . It is one of the precious anchors of Singapore's identity that have been able to withstand the pressures of change and rapid development. ASSOCIATE PROFESSOR JOHANNES WIDODO, from the National University of Singapore's School of Design and Environment in the Department of Architecture, on Lau Pa Sat's historical significance. Gazetted under the Preservation of Monuments Act in 1973, the former Telok Ayer Market is now surrounded by skyscrapers. All works on it must be approved by the National Heritage Board's (NHB) Preservation of Sites and Monuments division. It is the highest order of preservation status in Singapore. According to the division, the first Telok Ayer Market opened in 1823 and was a timber-and-attap structure located on the shore at the western end of Market Street. But by 1830, the structure had become dilapidated and was deemed extremely unsafe. In 1833, it was replaced with a new building that was constructed according to the design of Mr George D. Coleman, the first Government Superintendent of Public Works, who assisted in the planning of early colonial Singapore's town centre. In 1879, the market was demolished due to a land reclamation project at Telok Ayer Basin and relocated to newly reclaimed land at Collyer Quay. Municipal engineer James MacRitchie designed the new market and construction began in 1890. It was completed in 1894. In the 1970s, plans were made to transform the vicinity of the market. It was officially renamed Lau Pa Sat in 1989 after a Mass Rapid Transit tunnel was laid underneath. The building's entire structure was dismantled while tunnelling work was carried out. A few years later, it was reassembled piece by piece and reopened as a festival market. The building's Victorian cast-iron elements are among its defining features. The elements were prefabricated in Europe and crafted by an iron foundry in Glasgow, Scotland. Another distinctive feature is its high-ceilinged octagonal structure, which has eight radial passageways sectioned by large entrances, said the NHB. Such features maximise air circulation and ensure the market is well ventilated. The clock tower is arguably the food centre's most iconic feature. It is home to bronze bells and a jacquemart or a figure of a bell-striker, produced by a bell foundry in the Netherlands. Both were installed in 1991, said the NHB. Mr Goh Soon Chwee, 66, who has been running his kway chap stall for 21 years, said the old market used to have two levels - with the upper being the wet market and the hawker centre on the ground floor. Mr Goh, who has owned a stall there the longest, has no complaints about how the place has been changed over the years. The latest revamp in 2014 boosted his business by about 20 per cent. "The building is now neater and more elegant and hygienic," he said. Tourist Jennifer Tylutki, 35, from the United States, said the market looks like it is from another era because of features such as the clock tower. Said Associate Professor Johannes Widodo from the National University of Singapore's School of Design and Environment in the Department of Architecture: "The historical significance of this market is that it is one of the oldest tangible evidences of a marketplace in Singapore from the early colonial period surviving until today. "Its architectural style and the knock-down cast-iron structural system is one of very little that remains in Singapore. "The fact that it still exists shows how its importance is deeply rooted in many generations of Singaporeans' consciousness. It is one of the precious anchors of Singapore's identity that have been able to withstand the pressures of change and rapid development." He said it was important to keep intact as many of the building's authentic elements as possible, to maintain the integrity of its architectural character, for the sake of future Singaporeans.